Explanation: Welcome to Mars, NASA Insight. Yesterday NASA's robotic spacecraft InSight made a dramatic landing on Mars after a six-month trek across the inner Solar System. Needing to brake from 20,000 km per hour to zero in about seven minutes, Insight decelerated by as much as 8 g's and heated up to 1500 degrees Celsius as it deployed a heat shield, a parachute, and at the end, rockets. 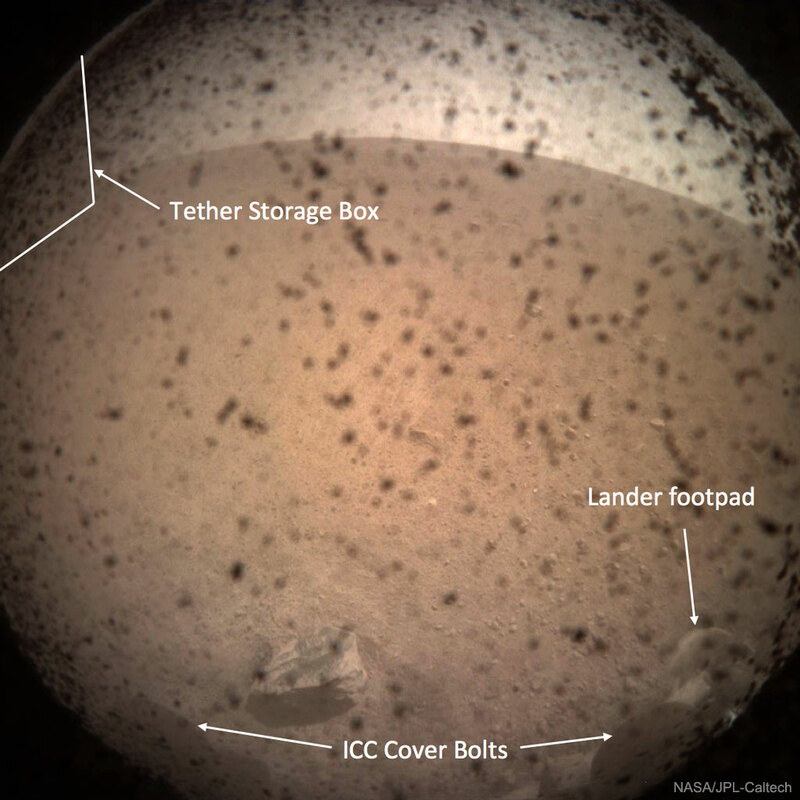 The featured image was the first taken by InSight on Mars, and welcome proof that the spacecraft had shed enough speed to land softly and function on the red planet. During its final descent, InSight's rockets kicked up dust which can be seen stuck to the lens cap of the Instrument Context Camera. Past the spotty dirt, parts of the lander that are visible include cover bolts at the bottom and a lander footpad on the lower right. Small rocks are visible across the rusty red soil, while the arc across the top of the image is the Martian horizon dividing land and sky. Over the next few weeks InSight will deploy several scientific instruments, including a rumble-detecting seismometer. These instruments are expected to give humanity unprecedented data involving the interior of Mars, a region thought to harbor formation clues not only about Mars, but Earth.